Secondary bone cancer. 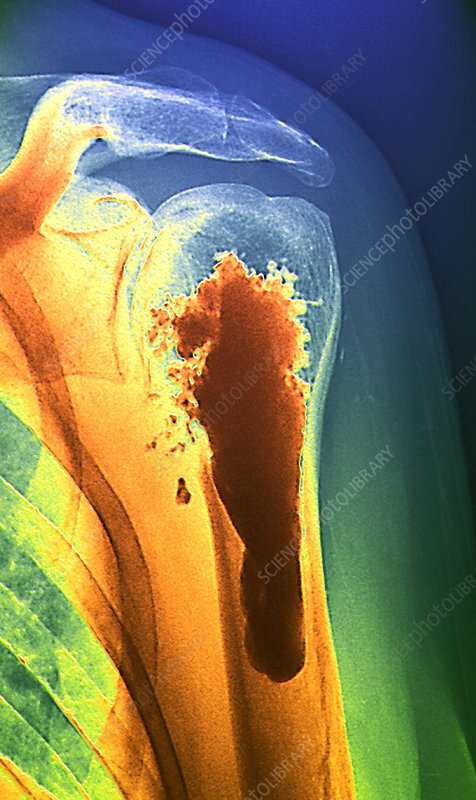 Coloured X-ray of a malignant (cancerous) tumour (orange, centre) in the humerus (upper arm bone) of a 48 year old patient. This is a secondary bone cancer, the cancer had metastasised (spread) from the primary site, which was a thyroid cancer. Spread of cancer to bones causes great pain and the bones have a tendency to fracture. The prognosis is poor. Treatment is with radiotherapy and chemotherapy.